Fifth Elevation can supply and install a variety of secret fixed systems to the highest of standards. We are approved installers of Kalzip aluminium standing seam, having gained expertise and experience in its supply and installation as members of the Teamkal network. Kalzip combines outstanding functionality with stunning aesthetics to create roofs and facades that exceed the most demanding construction and design requirements. As part of the Kalzip supply chain we provide a full technical service through having full manufacturer training and work closely with the Kalzip technical team. Both of Fifth Elevation’s directors have worked on award winning Kalzip projects, including The Mountbatten Centre in Portsmouth, which won the NFRC Best Sheeting Award in 2010. Fifth Elevation can supply and install your architectural wall panels. These composite, factory-formed, insulated panels with an exterior profile, are designed to present an upmarket look to any development. Built-up metal roofing and cladding systems are ideal for industrial projects. Coming in a range of external finishes and colours, they generally combine a steel liner, a vapour control layer, insulation layers according to thermal requirements and an external profiled sheet. Fifth Elevation’s experienced operatives will site assemble your built-up metal roofing and cladding system, allowing the design to accommodate a project’s bespoke performance requirements. The system can also be tailored to allow over- cladding of an existing building therefore up-grading the envelope to current Building Regulations. A variety of warranties are also available. Composite sheets and panels, provide a cost-effective solution for multi-part component installations. They are available in a range of profiles and designs, and can have either a PIR or Rockwool core, depending upon the manufacturer and performance requirements. At Fifth Elevation, we supply and install a variety of leading manufacturer systems, whether you require a trapezoidal profile sheets for an industrial design or flat or micro-ribbed panels for a higher-specification finish in a commercial setting. Fifth Elevation are experts in Rainscreen systems. A form of double-wall construction, Rainscreen keeps out the rain while providing excellent thermal insulation, ensuring the structural frame of the building remains bone dry. The outer layer breathes like a skin, while the inner layer reduces energy losses. Rainscreen’s pressure equalised technology prevents water penetrating through joins or openings. We can supply and install various support systems to provide a range of finishes, from discreet colour coated fixings to secret fixed systems. With the experience developed over years working within the roofing and cladding industry we are extremely well suited to undertake refurbishment works on existing buildings. The services we are able to offer clients include surveys, cost options, over cladding, removal and replacement, flat to pitch conversions or general maintenance services. Working with clients whether they be community associations, large corporations or property management companies we have the skills to offer bespoke solutions to the client’s needs. Single ply membrane flat roofing systems - At Fifth Elevation, we can supply and install a range of single ply membrane flat roofing systems. Please contact us for more information. Cold applied liquid flat roofing systems - This waterproofing system is a versatile solution for cold, inverted and green roofs. Please contact us for more information. 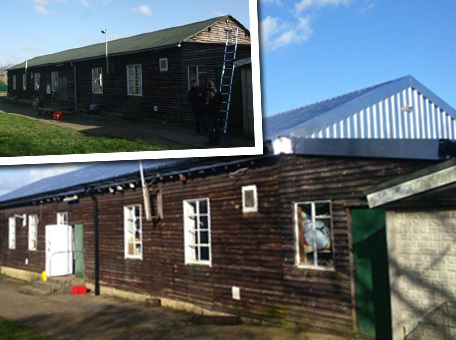 Gutter refurbishments - We refurbish gutters to the highest standard. Rainwater goods - We offer a range of rainwater goods. We can also assist with budgets, design queries, value engineering exercises, surveys, inspections and reports.